Explanation: It may appear, at first, like the Galaxy is producing the lightning, but really it's the Earth. In the foreground of the above picturesque nighttime landscape is the Greek Island of Corfu, with town lights surrounding Lake Korrision. Visible farther in the distance are lights from the town of Preveza on the Greek mainland. In the more distant sky a thunderstorm is threatening, with two lightning strokes caught together during this 45 second wide-angle exposure taken in mid-May. 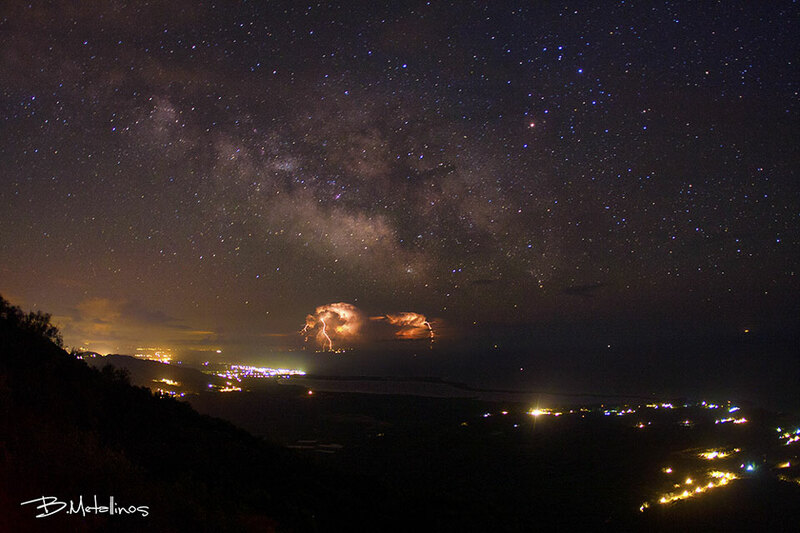 The lightning branch on the left appears to be striking near Preveza, whereas the lightning strike on the right appears to be striking near Mount Ainos on the Greek Island of Cephalonia. Much farther in the distance, strewn about the sky, are hundreds of stars in the neighborhood of our Sun in the Milky Way Galaxy. Furthest away, arching over the entire panorama, are billions of stars that together compose the central band of our Milky Way.